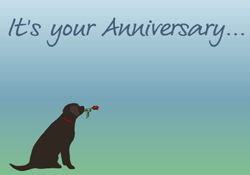 Our Chudleigh Anniversary card comes in two versions - one to send to your own spouse on your anniversary, and another to send to a couple celebrating their anniversary. The only difference is the text of the card. Music: Mendelssohn - Wedding March from "A Midsummer Night's Dream"